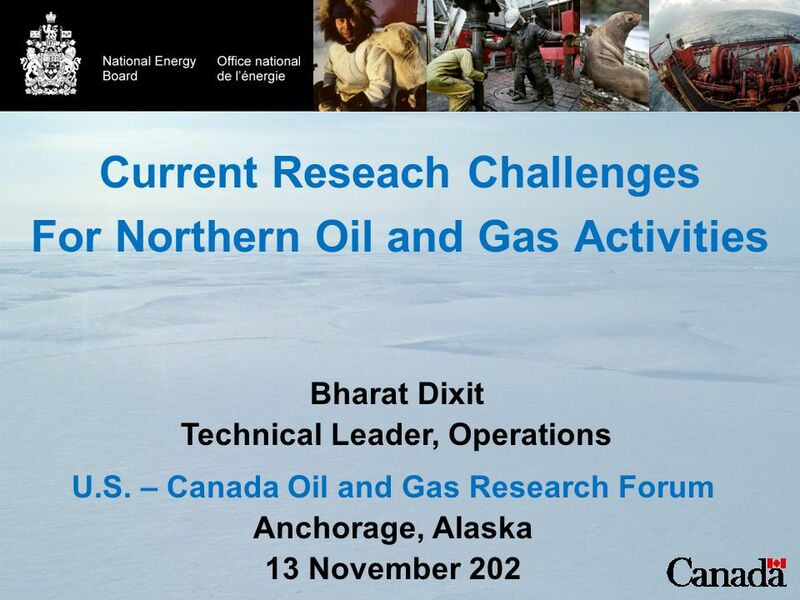 Current Reseach Challenges For Northern Oil and Gas Activities U.S. – Canada Oil and Gas Research Forum Anchorage, Alaska 13 November 202 Bharat Dixit. 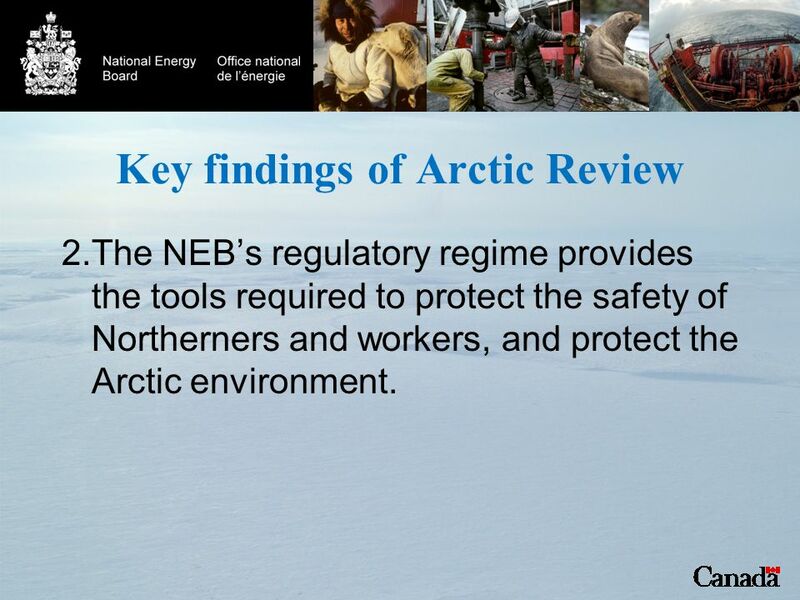 11 Key findings of Arctic Review 2.The NEB’s regulatory regime provides the tools required to protect the safety of Northerners and workers, and protect the Arctic environment. 12 Key findings of Arctic Review 3.The Board has re-affirmed our Same Season Relief Well policy. 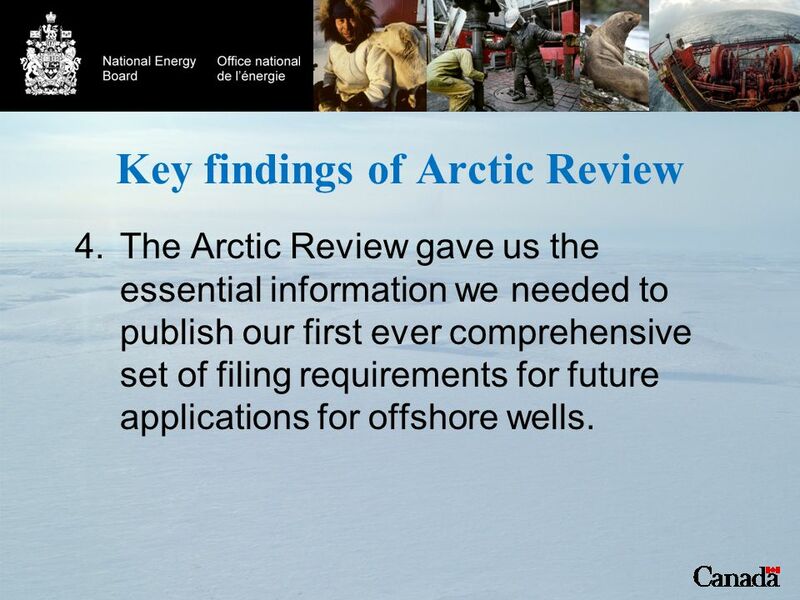 13 Key findings of Arctic Review 4.The Arctic Review gave us the essential information we needed to publish our first ever comprehensive set of filing requirements for future applications for offshore wells. 15 Key findings of Arctic Review 6.Effective response capability is essential in the event of an accident. 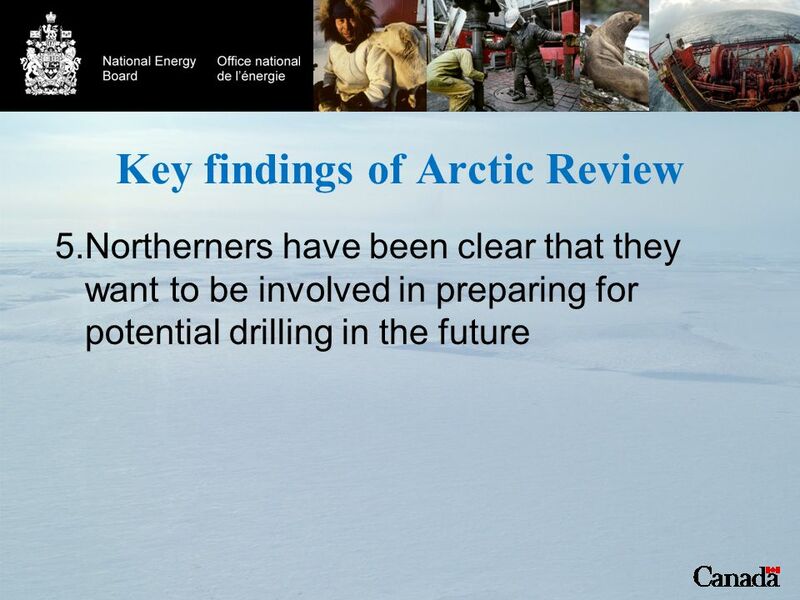 Download ppt "Current Reseach Challenges For Northern Oil and Gas Activities U.S. – Canada Oil and Gas Research Forum Anchorage, Alaska 13 November 202 Bharat Dixit." Governments role in the regulation of offshore exploration activities Commonwealth waters Environmental Sustainability Unit – August 2010. $63.9 Million to $87.2 Million. CIAP Energy Policy Act of 2005 allocated $250 Million annually to 6 states for 4 years Alaska Alabama California Louisiana. 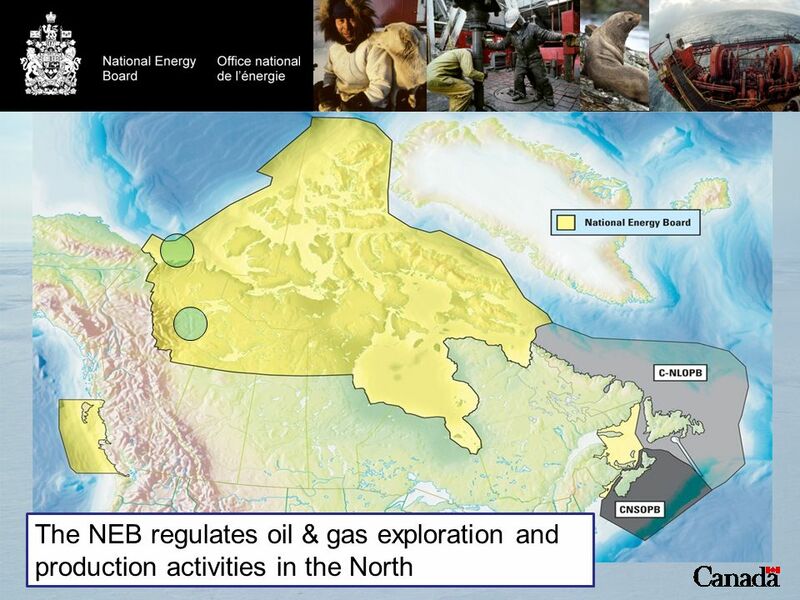 Responsible Resource Development April 17, Context Government focussed on responsible development of Canada’s natural resources to create jobs and. 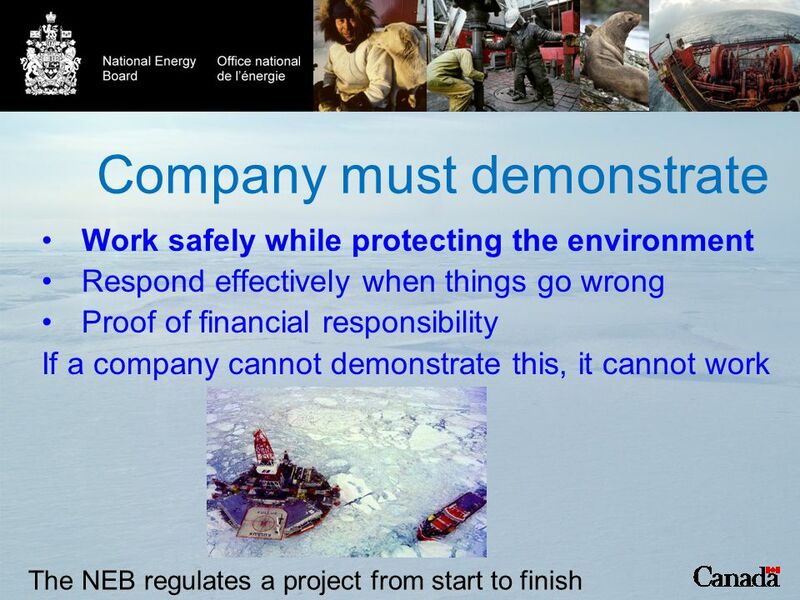 Responsible Energy Development Act Alberta Energy Regulator Update Alberta College of Professional Foresters. 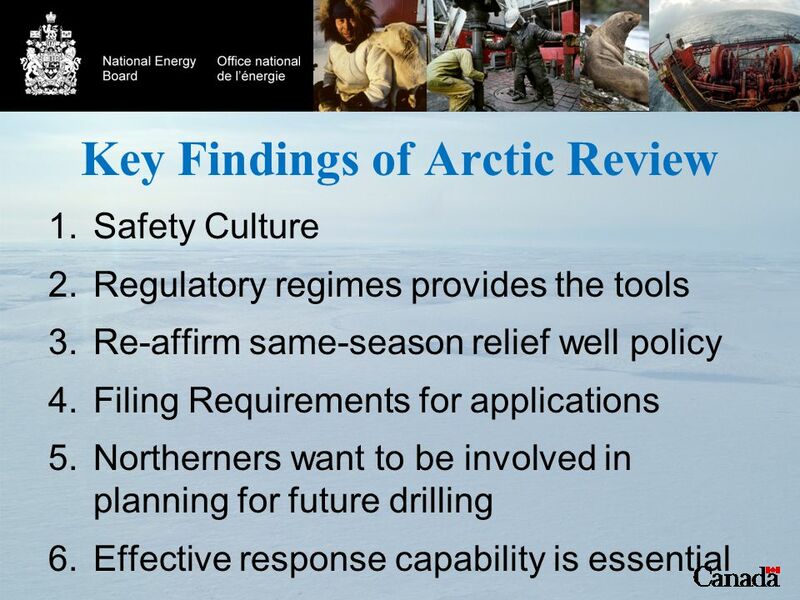 The Arctic: Opportunities and Challenges US-Canada Northern Oil and Gas Forum November 13, 2012 Fran Ulmer, Chair U.S. Arctic Research Commission. Corvelle Drives Concepts to Completion 1. Case Study: Implementing a risk-based continuous compliance assessment program ISACA Fall Conference 25 November. Community Committee Woodfibre Liquefied Natural Gas (WLNG) Project Interim Report September 16, 2014. 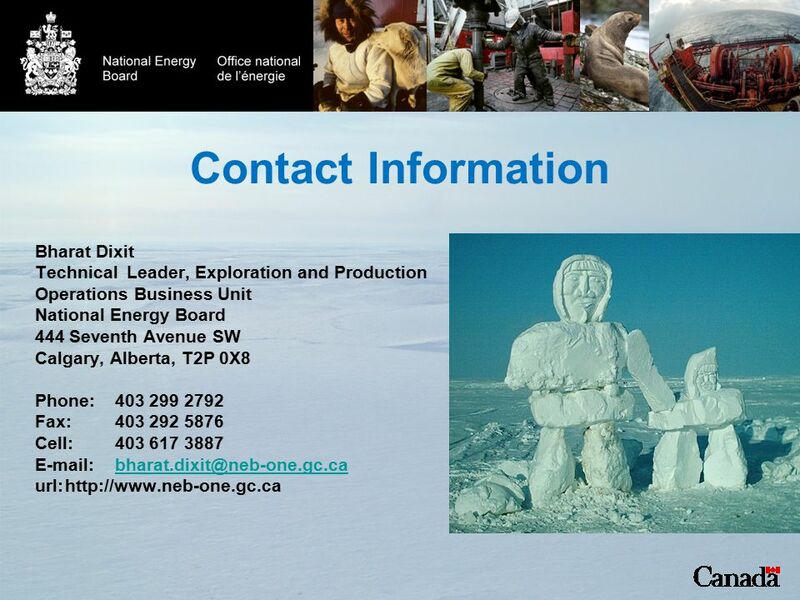 Canada-Newfoundland and Labrador Offshore Petroleum Board ICRARD 2010 W. Bobby. 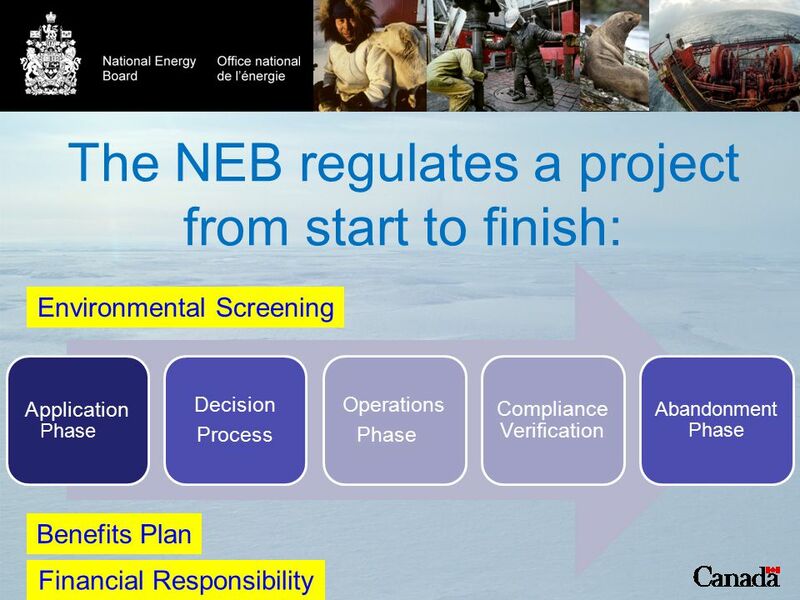  Missions & Activities Regulatory & Permitting  Bureau of Ocean Energy Management (BOEM) promotes energy independence, environmental protection and. 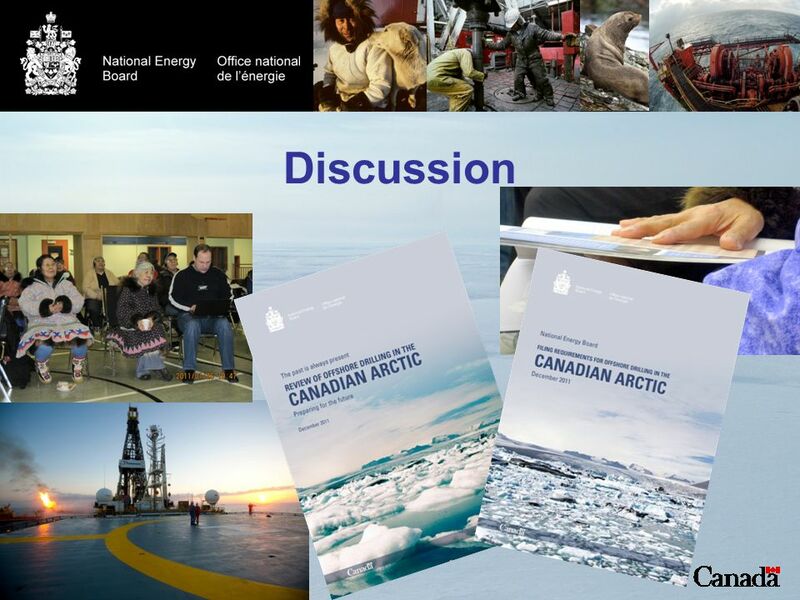 November 14, 2012 US-Canada Northern Oil and Gas Research Forum Anchorage, Alaska Building Sustainable Communities in the Arctic: the Resources and Sustainability. Baffinland Iron Mines Mary River Project November 2011 Community Round-Table Igloolik and Pond Inlet. Silo Compliance Risk vs. Enterprise Compliance Risk Presented to: ORIMS PD Day By: Joe Hardy & Tony Carlisle. 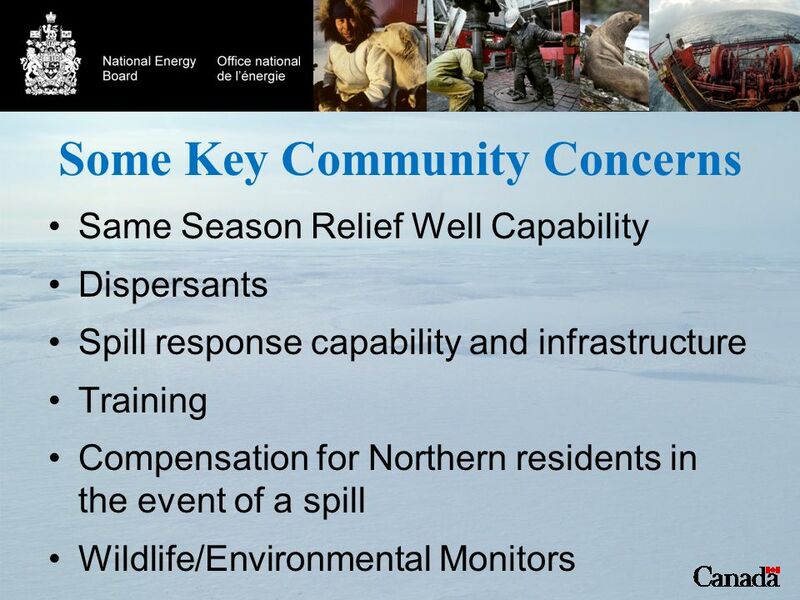 Interagency Refinery Task Force Safety Forum December 11, 2014. University of Washington Occupational and Environmental Medicine Program University of Washington Former Hanford Worker Medical Monitoring Program Summary. 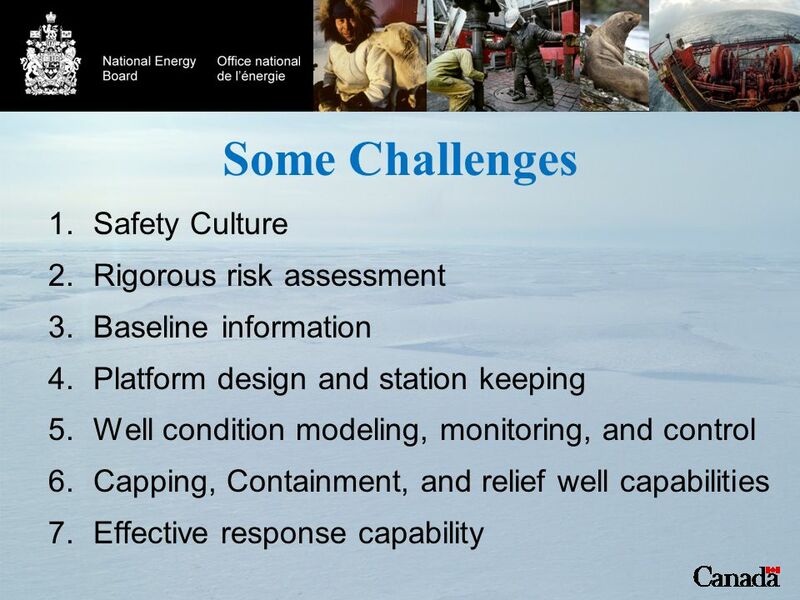 Environmental, Health, and Safety Guidelines ONSHORE OIL AND GAS DEVELOPMENT 1.0 Industry-Specific Impacts and Management Environment Environment 1.1.